I don’t know about you but this World Cup is one I will never forget, giving us all hope for the future ones to come. This opinion is backed by Power BI, whose forecasts make for interesting reading. Even so, England has crashed out of the semi-finals to a talented Croatia team, consisting of Modric, Rakitic and co. We go out with our heads held high, with at least the Golden Boot coming home and our biggest World Cup victory ever coming against Panama in a 6-1 win. All of this data shown is from 1966 to present, so you can remember the good old days of Bobby Moore lifting the ultimate trophy! The data shows that the powerhouses of Brazil, Germany, Argentina and Italy are the main competition. However, despite never winning a World Cup, the Netherlands are also a real threat in the future, even if they didn’t qualify for Russia. With a talented young group of players, much like England, they’ll be back with a vengeance in 2022. A lot can happen in 4 years! This is why I have hope. With players like Marcus Rashford, Trent Alexander-Arnold and Ryan Sessegnon hopefully growing into the players they look like they can be, along with many other players with high potential, there’s an element of hope, and maybe a bit of expectation. 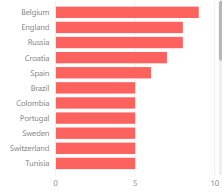 Using Power BI, we can show how many goals each country’s top scorer has stuck in the back of the net. Obviously, Harry Kane sits on top of the pile with 6. He’s followed by Belgium’s Romelu Lukaku, Portugal’s (and now Juventus’) Cristiano Ronaldo, and Russia’s Denis Cheryshev. However, with Romelu Lukaku the only one of Kane’s golden boot rivals left in the competition, playing against a so far resolute England, Kane can now dream of becoming the first Englishman to win the accolade since Gary Lineker in 1986. 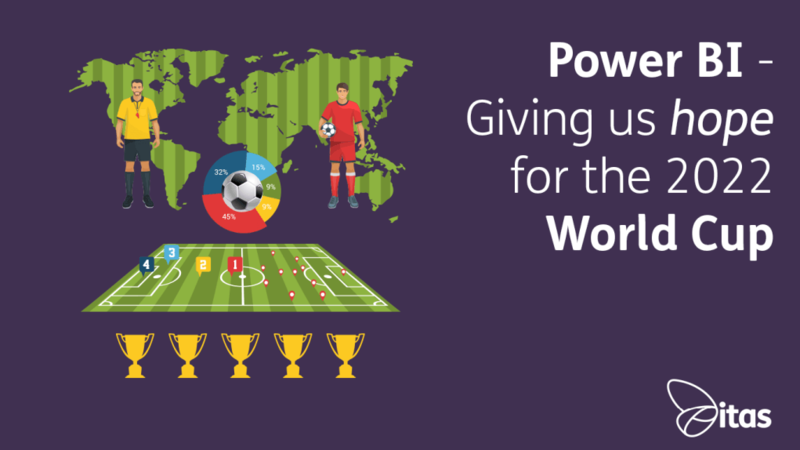 We can also use Power BI to show how many goals each team scored in the World Cup, specifically here the group stages. As we can see, the 3rd/4th playoff will take place between the highest scoring teams in the group stages, coincidentally both come from group G, England and Belgium. This may be a potential indicator of a vibrant encounter, or may show how poor Tunisia and Panama! Either way, this data builds the excitement for a highly anticipated 3rd/4th playoff game. How can Power BI help? 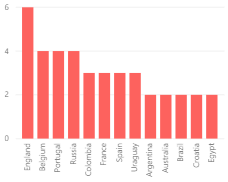 Power BI can’t exactly win the World Cup for Gareth Southgate and co. However, it can assist into identifying key men for opposition teams, as well as different opponents’ strengths and weaknesses. With the use of line, pie and bar charts to name a few, Power BI makes it that much easier to analyse data graphically to clearly show what England have done well, and what they can do to improve. Power BI may be helpful for England bringing football home, but it has a more business analytics use. Power BI is primarily used for business ventures, regardless of company size or market share. For example, it can analyze sales to profit ratios, sales of individual asset categories and order counts per financial period. Power BI incorporates an easy to learn, hard to master interface. As such, it is easy to use for beginners, and extremely useful for veterans of the software. Additionally, you can use drop down menus and sliders to specify what data you want to view. They are easy to create and have multiple practicality applications. For example, you can choose what type of product or sub-category of product you are interested in. 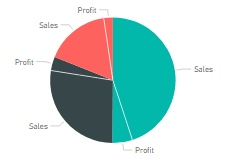 Power BI will then give you an in-detail analysis of your set parameters. It’s almost as simple as England’s 6-1 win over Panama! Will it ever come home? The all-important question, well, we have an answer for you. Yes! That’s according to Power BI’s prediction, which may be a bit too ambitious if I’m honest. This is only a basic model taking into account previous finishes by England in World Cups, but according to this forecast we won’t have to wait long at all. Only 4 years in fact! It makes sense, considering the recent trend in performances and our young squad. However, it looks like we’re on course for more than one charge for the title. We not only win it in 2022, but also in 2030, 2042 and 2050! 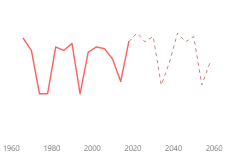 According to this model, we’ll have a dynasty set to rival the mighty Brazil’s 5 World Cups. However, don’t get your hopes up, as football’s an unpredictable game. There’s always a chance, however slim, that this prediction’s correct. It must be remembered, as the famous statistician George Box once said “all models are wrong, some are useful”, so you never know, we may win it in 2026 as well!